Nestled among the towns and villages of Southeastern Massachusetts are more than 14,000 acres of cranberry bogs. These bogs are the workplaces of the nearly 400 cranberry growing families of the Commonwealth. For generations they have nurtured and cultivated these wetlands, contributed to their communities, provided shelter and habitat for hundreds of plants and animal species, and helped to preserve the beautiful New England countryside. We invite you to explore the sections to the right to learn more about Massachusetts cranberry production, why it's unique, and what is happening on the farm during each season. Cranberries are a unique fruit. They can grow and survive only under a very special combination of factors. These factors include acid peat soil, an adequate fresh water supply, and a growing season that extends from April to November. Cranberries grow on low-lying vines in beds layered with sand, peat, gravel and clay. These beds are commonly known as bogs or marshes and were originally created by glacial deposits. Commercial bogs use a system of wetlands, uplands, ditches, flumes, ponds and other water bodies that provide a natural habitat for a variety of plant and animal life. The North American cranberry, Vaccinium macrocarpon, is the fruit recognized by the U.S. Department of Agriculture (USDA) as the standard for fresh cranberries and the cranberry juice cocktail. The European variety, which is grown in parts of central Europe, Finland and Germany, is known as Vaccinium oxycoccus. This variety is a smaller fruit with anthocyanin pigment profiles similar to that of the North American variety. The European variety, however, has a different acid profile in terms of the percentages of quinic, malic and citric acid levels present. In Europe, this fruit is commonly known as English mossberry. The cranberry is a Native American wetland fruit which grows on trailing vines like a strawberry. The vines thrive on the special combination of soils and water properties found in wetlands. Wetlands are nature's sponges; they store and purify water and help to maintain the water table. Cranberries grow in beds layered with sand, peat and gravel. These beds are commonly known as bogs or marshes and were originally formed as a result of glacial deposits. In Massachusetts we call the place where cranberries grow a BOG. Natural bogs evolved from deposits left by the glaciers more than 10,000 years ago. These deposits were left in impermeable kettle holes lined with clay. The clay prevents materials from leaching into the groundwater. Rocks and other organic materials were collected by the glaciers. When the ice finally melted deposits of heavy materials were layered on top of the clay. These kettle holes were filled with water and organic matter which created the ideal environment for cranberries. In the early 1800s Henry Hall, a veteran of the Revolutionary War who lived in Dennis Massachusetts noticed that sand blown in from nearby dunes helped vines grow faster. Today, growers spread a inch or two of sand on their bogs every three years. The sand not only helps the vines grow but also slows the growth of weeds and insects. Normally, growers do not replant each year since an undamaged cranberry vine will survive indefinitely. Some vines on Cape Cod are more than 150 years old and are still bearing fruit. Cranberries are grown through the northern part of the United States. The major production areas are New Jersey, Massachusetts, Oregon, Washington, Wisconsin and the Canadian provinces of British Columbia and Quebec. Other regions grow cranberries as well, to varying extent, and these include Delaware, Maine, Michigan, New York, Rhode Island, as well as the provinces of New Brunswick, Nova Scotia and Ontario. Cranberries are also commercially grown in Chile. These regions offer the special conditions that cranberries require, including sandy soil; abundant fresh water and a dormancy period that provides enough chill hours to produce a crop the following growing season. 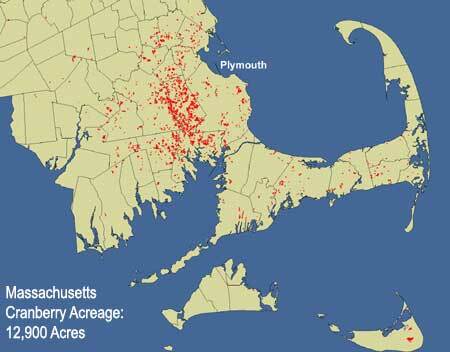 View a map of where Massachusetts cranberry bogs are located.